Tournaments | Wake up, Meeples! 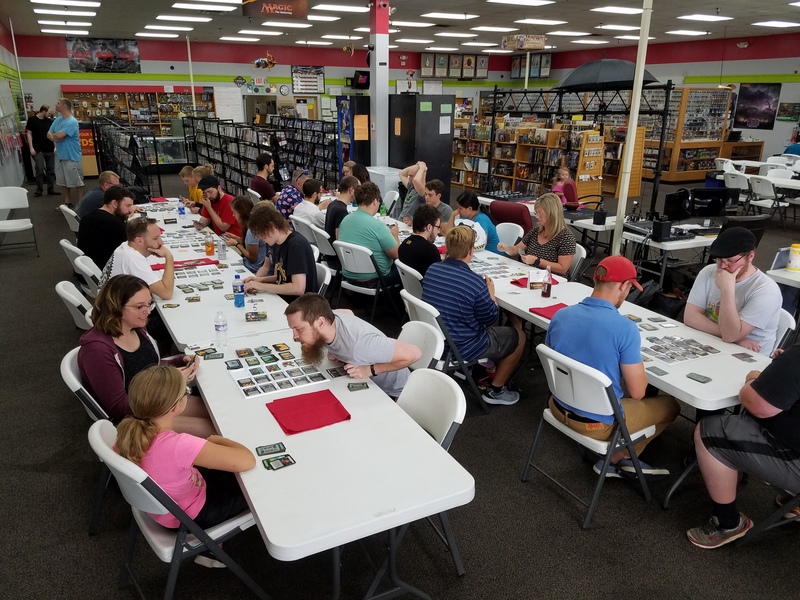 Every six months I host a Dominion tournament with physical cards in Mason, OH near Cincinnati at Game Swap. I’ve hosted ten tournaments so far and the turnout has been increasing recently (weather permitting). There is a $5 entry, and $4 of that goes into the prize pool which is split among the top three or four players in the tournament (depending on turnout). I made a Facebook group to help get the word out on Dominion tournaments in the midwest region of the USA — it includes my tournaments in Cincinnati, but also other tournaments in the area. If you’re interested in keeping up on Dominion events, feel free to join and invite your friends! The next tournament I plan to host will be a 2P tournament somewhere around September 2019. I’m hoping to have a date nailed down for that around June 2019. I have been asked many times about how to run Dominion tournaments. I’ve put my thoughts into this Google Doc (which is a work in progress) but you can also send me questions at adam@adamhorton.com and I’m happy to help in any way I can. This isn’t limited to telling you about my experience — I’ve helped run and promote tournaments in the past as well. RSVP is not required, you can just show up and play in the tournament; but if I know you’re coming it helps me prepare. Also, if you’re travelling in for the tournament as many people do, it’s been useful for me to know when you’ll arrive so I don’t start the first game right on time if you’re running a bit late. When I get flexibility on which date tournaments can be held, I will ask travellers about their availability as well. I alternate my tournaments between 3-player games and 2-player games; for the 3P tournaments I can get official support from the publisher, Rio Grande Games, and pre-qualify the winner for the finals of the world national tournament held every year at GenCon in Indianapolis, which has a $1000 prize for the winner. If you’d like to make sure you’re in the loop for future tournaments, or if you have any questions for me, feel free to send me E-mail at adam@adamhorton.com. Below I’ll list all of the information I have for the tournaments I’ve run in the past. This includes links to Facebook events and Google spreadsheets where I’ve organized everything. These spreadsheets include all of the kingdoms used in the tournaments and many backup kingdoms that were never used.